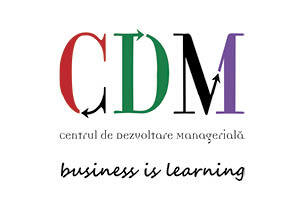 The Centre for Development in Management (CDM) started in October 1994 and works as an NGO Foundation from 1995. Our founder members are The British Embassy Bucharest, The Babes-Bolyai University, The Cluj County Council, The Cluj Chamber of Commerce, Leumi Bank, Transylvania Bank and The Technical University. CDM Consulting was born as the consultancy division; it is the structure that offers consultancy companies. We strongly believe that “Business is Learning” and this principle underpins both our work for clients and our internal programmes for enhancement and continuous development of skills and knowledge. Working side by side with our clients is the main resource for experience and learning, and we enrich this by participating in training stages in Romania and abroad offered by prestigious organisations. Companies that contributed to our development are in Italy – Gruppo SOGES, Finland – Tulossilta, Great Britain – Ashridge Management College, Chartred Institute of Marketing, DUBS University, Sunridge Park etc.Our growth and development was facilitated by the initial three-year programme designed by Roffey Park Management Institute, U.K.Working along Roffey Park Management Institute consultants structured our abilities and expertise and gave us the ground to build clear organisational values and rock-solid ethical principles in the relationship with our partners. Since 1997, CDM has been affiliated to Roffey Park Management Institute, Great Britain, one of the most prestigious management centres in Europe, with over 60 years of experience in transforming organisations. We are proud that beside prestigious companies that are operating in Romania like Alcatel-Lucent, Automobile Dacia – Group Renault, BRD Societe Generale, Ford, Lafarge Group, Petrom, Transylvania Bank we have offered services (delivered in English) for people from other countries in Europe (Bulgaria, Czech Republic, Hungary, Germany, Slovenia, Poland, Russia) for clients like Allied Domecq – Pernod, PriceWaterhouseCoopers or even in Asia – American Peace Corps. “Our mission is to become a model organisation highly respected for the support it offers in the change and the development of organisations. Our team of professionals delivers training and consultancy at international standards that creatively respond to the evolution of the business environment.” CDM Mission. One of our central goals is to support the intricate processes of defining and developing the productive behaviours and practices within organisations encouraging people to liberate their creative potential and to be more responsible for their own and their organisation development.